In this review, we’re going to be looking at the Shark Navigator Lift-Away Pro upright vacuum cleaner. More specifically, well be looking at model number NV356E. Compared to the other vacuums in this series, the Lift-Away Pro has a modern white body and a redesigned dust cup. The design of the Shark Navigator Lift-Away Pro is both sleek and modern. This vacuum cleaner is a 2-in-1,transforming from an upright to a portable handheld with a single button release. Another design note is the redesign of the debris canister between the Shark Navigator Lift-Away (Standard) and the Shark Navigator Lift-Away Pro. With the Pro, the dust bin has a thinner look from the front of the vacuum, as well as an elongated form. This allows the dust bin to look slender, while still holding 2.2 quarts of dry debris- almost twice the capacity of the standard Navigator Lift-Away. The Shark Navigator Pro upright vacuum cleans using a combined method of spinning brushes and suction. Spinning brushes on the head of the vacuum help to loosen dust and debris from carpet fibers and then suction from within the vacuum helps to lift the debris from the floor and into the dust bin. The 2-in-1 design allows the Shark to function as a standard upright or also as a more mobile handheld canister style vacuum. The canister portion of the Shark can be removed from the handle portion of the unit, allowing users to more easily move the vacuum from room to room, clean stairs, or handle other tasks. The Shark Navigator vacuum cleaner includes a variety of cleaning tools, including a handheld wand, crevice tool, wide hose tool, extension wand, and duster. These added accessories are all designed to target specific cleaning tasks and provide a nice degree of flexibility in how the Shark vacuum is able to clean. 2-in-1: Use as an upright or a canister. As an upright, this vacuum weighs 13.7 pounds. As a canister, it weighs 8 pounds. 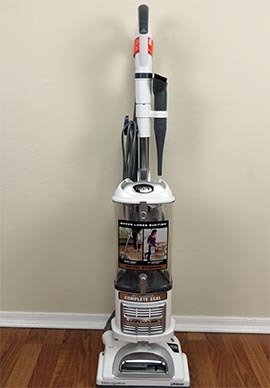 The Shark Navigator Pro is a full-size upright vacuum cleaner that stands 45” tall (or about 3.5′.) The head of the vacuum is 3” tall, with a 9.5” cleaning path, which allows this vacuum to clean under most furniture and accessories. As an upright, the Navigator Pro weighs 13.7 pounds and as a handheld, it weighs 8 pounds. This makes it reasonably easy to maneuver, strictly from a weight standpoint. The accessories that come with the Shark Navigator Pro provide a good variety of uses and application. The dusting brush, pet power brush, and crevice tool are useful when operating this vacuum as a handheld, while the Dust-Away hard floor attachment is useful when operating it as an upright vacuum. The following vacuum cleaner tests are designed to show how the Shark Navigator Pro vacuum performs on different surfaces, picking up a variety of debris types. The Shark Navigator Pro vacuum performed well on the hardwood floor tests. All four of the debris fields scored at least an 83% and above. That said, I would have liked to see the Navigator do a better job of sucking up the cereal. Rice, kitty litter, and sugar were no match for this vacuum while on hardwood floors, but the cereal had the tendency to be pushed around before being fully cleaned up. The Shark Navigator scored approximately the same for the rice, kitty litter, and sugar performance tests compared to the Shark Rocket and Shark Rotator. However, it did have a markedly better cereal cleaning score compared to each of these other Shark models, coming in at 83% compared to the Rocket’s 65% and Rotator’s 77%. Low pile carpet was the surface on which the Shark Navigator Pro performed best. After testing this vacuum against each of the debris fields, the worst score came from sugar, which scored a 91%. This Shark vacuum allows you to manually adjust the suction power while in use, which was a huge benefit on the low pile carpet. The goal is to avoid any resistance when pushing or pulling the vacuum. During this test, I was able to create a smooth roll down and back, which allowed the vacuum to perform at a high level. The high pile carpet test was a bit trickier. The suction was harder to get right; therefore, the debris was not easily cleaned up. While the Shark Navigator Pro did not perform extremely well during this test, it does have the ability to go back and clean the messes up. Cereal was difficult for the vacuum because once the brushroll started, the vacuum sank into the carpet, meaning the cereal was now elevated above the nose of the vacuum. After running our normal test with the Shark Navigator Pro vacuum, I did go back and increase the level of suction. After doing so, the vacuum was able to dig deeper into the carpet and virtually lift everything back up. So while the vacuum may not be able to get everything at first, you do have the option of going back over the debris with a higher degree of suction and you can expect it to perform better. To that end, the higher degree of suction makes it harder to push and pull on higher pile carpets. The vacuum cleaner wants to hold onto the carpet, creating a more labor intensive cleaning session. If you do have especially high carpets you will definitely want to adjust the suction valve to get it properly tuned to what works best for your carpet. Concerning usability, the Shark Navigator Pro is pretty user-friendly. Since this vacuum does come with an assortment of parts, the initial setup may be a little daunting. However, once assembled, it is easy to operate. Switching back and forth from upright mode to handheld mode is quick and easy. There are a few buttons and latches, but nothing overly complicated. Everything is clearly and intuitively labeled, making the transition fast and painless. When using the vacuum as an upright on hard surfaces, you just have to lower the head by pressing it down with your foot (an image on the vacuum denotes this). As you move to carpets or rugs, you will have to turn the power button to level 2, which turns on the brushroll. Turning on the brushroll allows the vacuum to agitate the surface and remove any dirt / debris before sucking it up. The maneuverability of the Shark Navigator Lift-Away Pro is a bit of a tricky question. As an upright vacuum and a handheld canister, this vacuum has the ability to compensate some of its shortcomings through it dual-purpose. For instance, hard to reach areas for the upright can easily be reached with the handheld. And if the weight of the handheld gets too heavy to maneuver, it can be clicked right back into the base and run as an upright. All things considering though, I do think that the maneuverability is pretty good. The long cord allows maneuverability even in large spaces and the extending hose can get those awkward nooks and crannies. As a handheld canister, I do think it’s a little heavy to carry for any long period of time, but for quick spot cleaning, baseboards or stairs, I think it’s relatively easy to maneuver into those hard-to-clean areas. In an ideal world, I would have liked to see the handheld weigh a little less and be a little less awkward to carry. If you decide to follow the manufacturers recommendations, the annual cost to maintain the Shark Navigator Lift-Away Pro is around $60. Bear in mind, depending on how often you use your vacuum (and how much you vacuum), some of these parts may not need to be replaced as often. That said, I think the manufacturer’s recommended replacement schedule may be a bit aggressive. I think replacing the foam foam filters and dusting pads annually, and replacing the HEPA filter and brushroll every 2 years, is sufficient for most users. Following this more conservative replacement schedule your annual maintenance costs are around $20 / year. At 3′ away, the Shark Navigator Lift-Away upright vacuum emits 77 dB of sound. So the million dollar question- is the quality and performance worth the cost? 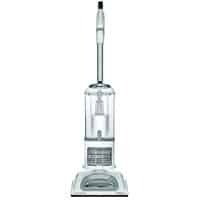 To establish a vacuum’s value, we look at a combination of all the factors and features concerning the vacuum and compare that to the price. The Shark Navigator comes with an assortment of accessories for various cleaning styles which means that you don’t have to buy those separately. The maintenance costs are pretty low and there are not many different parts that need replacing frequently. Lastly, let’s look at cleaning performance. Overall, the Shark Navigator Pro did excellent on the hardwoods and low pile carpet. The high pile carpet caused a bit of a struggle, leaving at least 20% of the debris in the carpet for all the tests. The initial cost includes the body, filters, and assortment of accessories which makes this a machine that you can use in many different areas of your home. As for the warranty and return policy, the Shark comes with a 1 year warranty, and 30-day return period. Both policies seem to be in line with industry standards. The buyer is responsible for shipping costs back to the manufacturer and the vacuum must be registered within 10 days of purchase. Who Should Buy the Shark Navigator Lift-Away Pro vacuum cleaner? So is the Shark Navigator Pro for you? After putting it to the test and comparing its performance to like models, I would say that the Shark Navigator Pro is an excellent upright vacuum. It’s a great value and its adaptability from an upright to a handheld canister provides a nice degree of flexibility in handling stairs and other awkward-to-clean areas. I would recommend the Shark Navigator Lift-Away Pro if you’re looking for the following features in an upright vacuum. Like the idea of two vacuums in one – An upright vacuum that serves the purpose of an upright and a portable handheld canister is both a nice value addition and space saver. Eliminating the need to switch back and forth between units is also a time saver. Want something powerful & lightweight – This upright vacuum cleaner only weighs 13.7 pounds, almost 2 full pounds lighter than the Shark Rotator. If you like the design and usability of Shark, but want something lighter, this may be a good option for you. Want included accessories – This vacuum comes with a dusting brush, an 8″ crevice tool, a pet brush, Dust-Away hard floor attachment and two microfiber pads. This provides a lot of options and different ways to clean particular spaces. For more information on the Shark Navigator Lift-Away Pro, visit Amazon.com. April 3, 2018 – Updated our maintenance section with more accurate price estimates and replacement frequencies. August 7, 2018 – Updated the review score as part of our site-wide 1.0 scoring overhaul. Score increased from 90% to 91%. The Shark Navigator Lift-Away Pro vacuum is a 2-in-1 vacuum designed to give users the option of a powerful upright or maneuverable handheld. This Shark vacuum is a good option for those who need a quality vacuum, but don’t have the money, or don’t want to spend the money to get an expensive vacuum. With several cleaning configurations available, the Shark Navigator Lift-Away Pro is a well-rounded option for a vast majority of users.